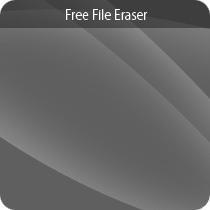 Free File Eraser is a data wipe utility for complete and irrevocable file erase. This free file shredder software allows you to shred files, folders as well as recycle bin by overwriting them several times using US Government standard wiping and cryptographically strong random number key, leaving no possibility of recovery. Permanently erases, total peace of mind for sensitive data. This is useful for both individual and company which want to keep their business secret from being disclosed or stolen like passwords, personal information, classified documents from work, financial records, self-written poems, etc. 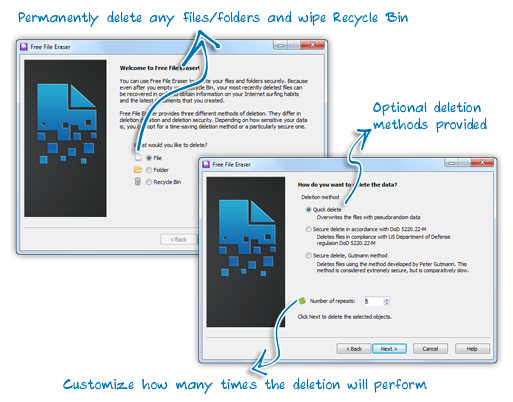 You just drag and drop files and folders to the main window of the program, and choose the proper erasing method, our file erase will protect your privacy with a fast, safe and reliable way. For most people, deleted files are like zombies: they're not really dead. When you delete a file, Windows changes a special byte and marks the occupied space as free space. But the file content remains unchanged on the disk. In this case, Free File Eraser is a big help for you, as it ensures the permanent deletion of multiple files/folders saved in different locations of computer system. Files deleted by this software cannot be recovered by any third party software, even by special hardware devices. Contrary to popular belief, emptying your recycle bin does not permanently delete the files are in there. Just like any deleted files, the files that are deleted from the recycle bin are still there - just simply marked as available space. To permanently delete files from the recycle bin, Free File Eraser, which works as a recycle bin shredder, is your right choice. It enables you to empty and wipe recycle bin to prevent the deleted files from recovery with the help of sophisticated software. Extra vigilance is essential in handling data stored in computer hard disks as we store a lot of private and confidential information in them. To protect your company's financial information and yourself from data and identity theft, you need to delete hard disk data using the Free File Eraser instead of deleting it permanently using Shift + Delete keys of Windows OS. This free file shredder is an advanced security tool for individuals and businesses wanting to securely shred confidential files and clean-wipe hard drive free space to ensure that no private files can be recovered. Free File Eraser is a file shredder utility developed to erase unnecessary bulk files which take up huge amounts of precious drive space & memory on your computer and cause your system to run slowly. Just several clicks, it will remove those unwanted files that you no longer need to free up valuable disk space and enhance our computer speed. Using multiple mechanisms to permanently remove the specified content from the system, Free File Eraser offers 3 shredding methods to shred files without leaving any chance to recover them back. It contains list of file shredding methods using different staunch algorithms such as: US Dod 5220.22-M erasure method, Gutmann method and quick delete method. You can opt for any method according to your requirements. Each option carries different hard-core deletion methods and performs multiple operations repetitively over file/folder to be certain that everything is gone. Free File Eraser is an easy to use and secure shredder tool for Windows. As a convenience, it allows you to simply drag and drop your private files/folders into the main program window of shredder to permanently remove them from your hard drive forever. Now, you don't need to select your files/folders by clicking the browser button, what you need to do is to drag the items you want to delete and drop them to the program. There is no hidden cost, no function limit to delete files from your computer in a secure fashion making it impossible for anyone to retrieve with Free File Eraser. Never waste your money on those expensive ones that won't work! It also saves much money spending on those paper shredders used in your office. Now, just try this 100% freeware to erase your files. By permanently shred files/folders from your hard drive and recycle bin that take up valuable disk space or you don't need any longer, Free File Eraser helps slim your system, increase your computer's speed and performance. Now, it is amazing that your PC will act like new and run faster. Free File Eraser is a digital file shredder that helps shred unwanted files silently instead of using those loud paper shredders that leave mountains of finely shredded paper in their wake to keep your ear healthy. This free file shredder doesn't leave shredded bits about for you to clean up later and makes a contribution to protecting the environment. Keeping your privacy totally safe, Free File Eraser is guaranteed not to contain any spyware, viruses or any other kind of malware. As an easy-to-use digital file shredder, it is able to shred files, folders and recycle bin to prevent data recovery with three-step process. All you need to do is launch the program, select the files to shred and use one of its algorithms. It provides three ways to zap the unwanted data until they are completely unrecoverable: overwrite with pseudorandom data, delete with DoD5220.22-M and delete with Gutmann method. We tried to recover the deleted files with some professional tools yet none of them was restored. Reliable file shredder software. We didn't detect any remains of the shredded files afterward. It does what it promises. 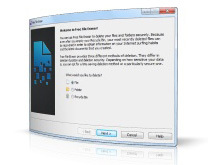 Free File Eraser helps delete files/folders/recycle bin to keep information secure. 100% Freeware.